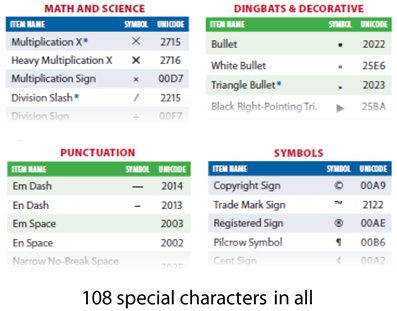 108 Unicode characters for STEM, punctuation, dingbats, emoji, and other special characters. 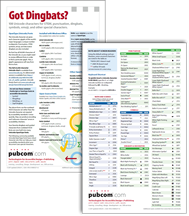 Got Dingbats is a handy 2-page guide to the most commonly used Unicode characters for STEM symbols, punctuation, dingbats, emoji, and other special characters for publishers. Also recommends OpenType/Unicode fonts with extended character sets, as well as open source fonts for royalty-free use on websites and embedding into published PDFs and EPUBs. This expanded and updated chart now contains 108 of the most often used symbols and special characters for publishing (print, web, digital, PDF, EPUB)—all in Unicode, the computer-industry's universal character set that's required by accessibility standards. Each symbol is shown with its generic name (usually what is voiced by screen readers), a sample of the symbol, and its Unicode codepoint so that you can quickly insert it into your document. We also indicated which symbols are not yet voiced by JAWS and NVDA screen readers (using their default out-of-the-box settings). Back in the early days of typesetting when newspapers and other periodicals were set by hand, printers would place fanciful ornaments in extra white space when stories ran a tad short. Each printer developed a collection of dingbats to use when needed. Today, your Unicode / OpenType fonts continue the centuries-old tradition and have different assortments of dingbats, as well as traditional STEM, punctuation, and foreign language glyphs as well as emoji other modern symbols. 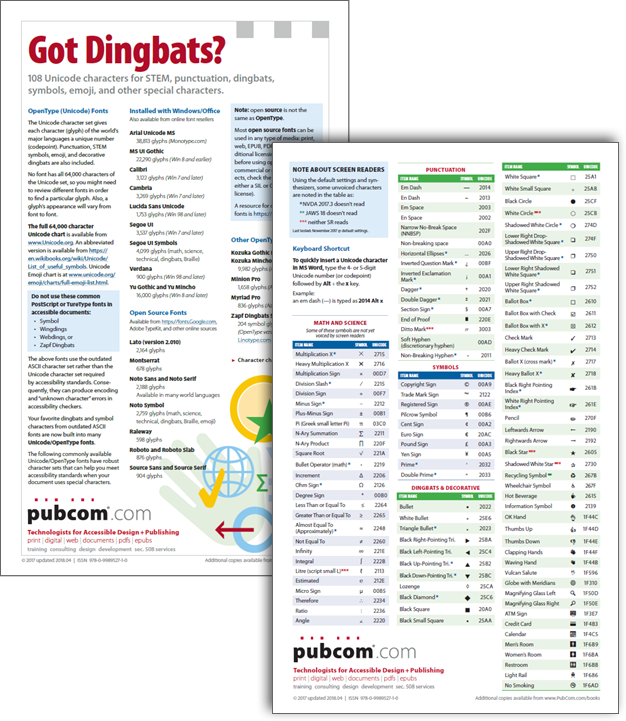 The chart PDF is a digital download that's fully accessible. After purchase, you can print a copy for personal use on legal size paper—tack it to your cubical wall or tack board so that it's handy as you work. Bulk prices are available for multiple users. Title: Got Dingbats? 108 Unicode characters for STEM, punctuation, dingbats, emoji, and other special characters. License: 1 license for each user is required. Group licenses are available. This edition is only available as a digital download (accessible tagged PDF) with the ability to print it (designed for front/back of a legal size sheet). This PDF chart is fully accessible for those using assistive technologies and showcases the methods detailed in the book. Order this chart through our online bookstore.